Homemade corn chowder is one of the most delicious foods and tasting it always reminds me of home. I love the milky and salty base along with the texture of pork and corn. My mom makes and grandma made the best corn chowder and when a friend brought me back fresh corn from Wisconsin I knew there was only one thing to do with it: make corn chowder. First, the Wisconsin corn. Yum-ola! I realize Florida is heavy into agriculture but there’s something about vegetables grown in fertile soil of the North. 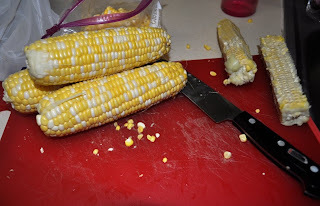 The corn was incredibly sweet and crisp – absolutely delicious. Milk or half and half or cream. Notice anything missing? Quantities perhaps? Cut salt pork into small pieces - fry till almost crisp and be careful not to burn. Add diced onion toward the end and cook ‘til translucent. 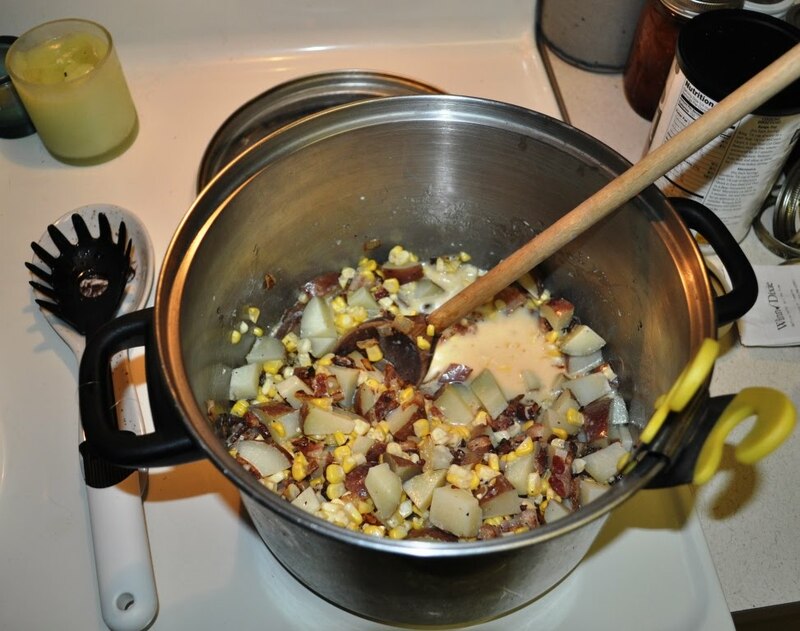 Add a can of evaporated milk, corn, and potatoes which have been diced and cooked ahead of time. Corn can be canned, frozen or fresh cooked and cut off the cob. Heat and add milk. Do NOT boil since the milk will curdle. You can add other ingredients if you want such as parsley, grated cheddar, etc. on occasion. You may want to try some other spices, too. I chopped the bacon into small bits and fried it. Because of the quantity I friend half a pound at a time. When it was about done, add half of the diced onion and cook until the onion is translucent. 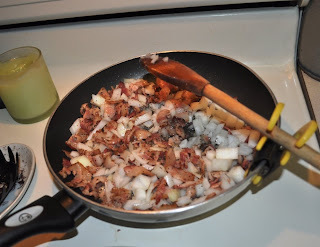 Pour the bacon, onion and three quarters of the grease into the pot. Add the evaporated milk, corn and potatoes. Heat over medium heat and stir. 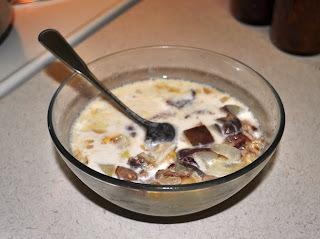 Once mixture is warm add the milk and Half and Half on low to medium heat until cooked. Do not boil – it’ll curdle and make you sad you can’t enjoy the incredible chowder. I didn’t add any salt or pepper because the bacon had enough of both. I froze much of the chowder and it freezes very well. When ready to eat I completely thawed it in the refrigerator before heating in the microwave in 45 second intervals.